Photo Measures is the most elegant and the easiest way to save measures on your own photos on iPhone, iPad and iPod Touch! Architectural Digest - "Very useful when shopping or meeting with contractors"
Tuaw.com - "It's perfect for your own work around the house, and handy for creating plans to bring to a contractor"
AppSafari - "So incredibly convenient"
Featured on the front page of the AppStore under New & Noteworthy and Staff Favorites in more than 70 countries, including the US, France, Germany and Canada. Constructing a house? Engineering a new project? Moving to a new place? 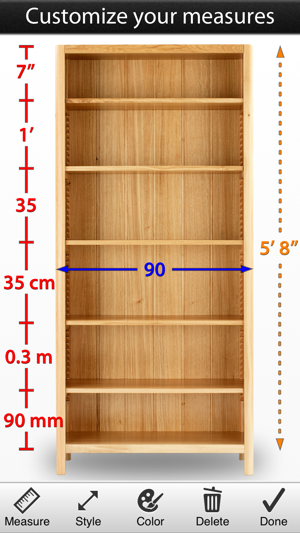 Take some photos and note down the dimensions on the photos to remember the exact layout, and to make sure that everything will fit easily. Are you decorating? Want to buy a new frame or a new furniture but not sure it will fit? 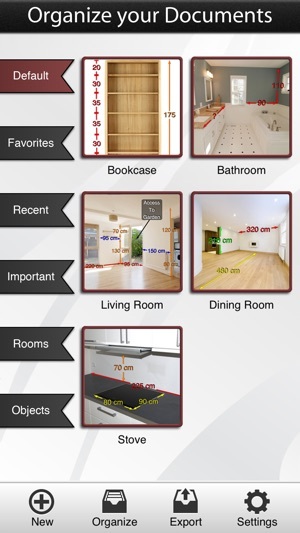 No problem since you can have all your house dimensions always with you! 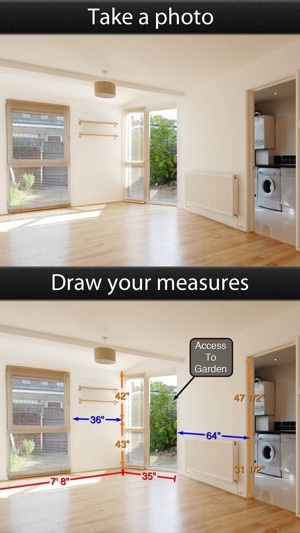 Someone who wants to keep his house's measure easily accessible? 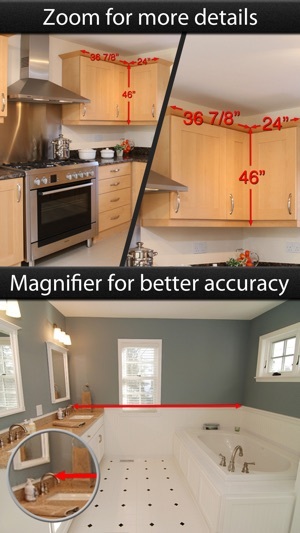 Whenever you need to save dimensions, sizes, angles or write down a detail you need to remember, Photo Measures will help you to be more efficient and more accurate. The next updates will also have more features available only through the full version. Thank you all for your very positive feedback! - we added a new « Style » menu where you can find new options to customize your measures. 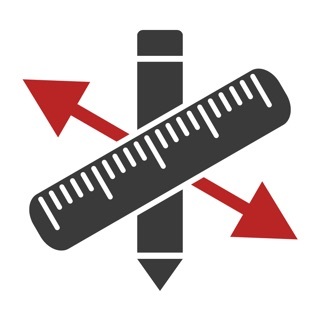 For example, you can now change the position of a measure along its line or decide how to orient it to improve the readability. - we improved our synchronisation system with Dropbox (for syncing across devices or backing-up even faster). 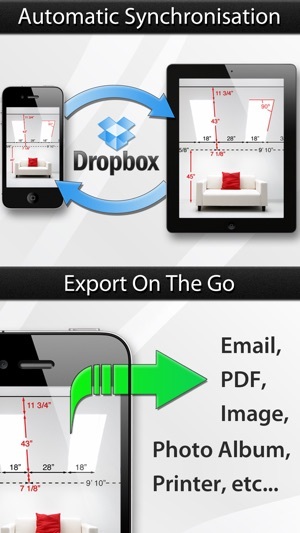 The first sync with Dropbox will optimize your data and may take some time (depending on the amount of data you have). But once it is completed, you are all set. Why do you call these measuring tools when all you can do is take a picture and then you have to measure it yourself and write it on the app. That is not called MEASURING! That is called storing pictures that you can type numbers and measurements into! 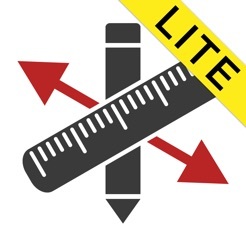 I was under the assumption this app would provide measurements for the object I photographed. It doesn't! Pointless!!! I imported a kitchen image from a job I did once before, and used the image as a test for this product. I was able to layout the entire kitchen cabinets ( uppers and lowers ), the dishwasher, fridge, and lighting in under 30 minutes. I emailed it to myself as a test and it arrived within seconds. This program ( LITE VERSION ) will put a watermark across your images until you purchase the Full version. SO WHAT !!. This program is definitely on my must have list. Very easy to use, very clear measurements, top quality emailed picture returned, interface is so easy to use. As a Licensed General Contractor, my clients are going to really love seeing instant answers and results with this program.